These places have become hard to find, difficult (or illegal) to access, dangerous to explore ... great to spend the day ! Today, the pyramids of the industrial revolution just uselessly stand in the way, they're a scar in the landscape. The deafening noises have been replaced by silence, but if you listen carefully they will tell you their story. and where once doctors and nurses walked through the shiny corridors. and fiercely withstanding all the storms of the past century, a decayed symbol of wealth for the rich. Why are abandoned places so attractive ? I was born on august 22nd 1968 in Brussels, Belgium. 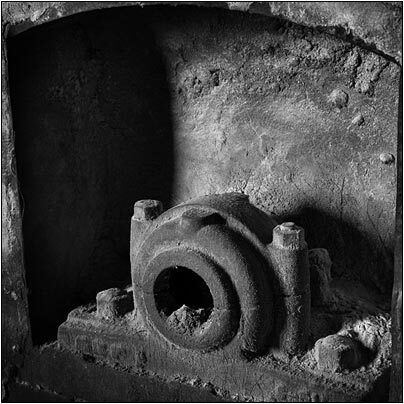 At age 16 I got my first camera and at 20 I made my first photos at the Buda Marly plant (and got arrested straight away). 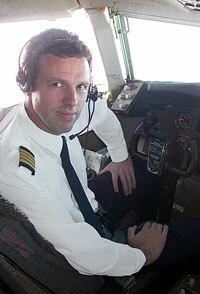 Professionally I've been a pilot since age 22, first on the Boeing 737, then 767 and also the airbus 320. I flew as a captain on the a320 until Sabena (Belgium's national carrier) went bancrupt in 2001. Now I'm flying the boeing 787 for ArkeFly (Tui Netherlands, dutch charter company), flying to holiday destinations. What does your book look like, how can I purchase my copy ? What photographic equipment do you use ? Do you sell photographs ? Can I use your photographs for the design of CD sleeves, to decorate my website, ... ? How did you start doing this ? Is there such a thing as "urban exploration ethics" ? why aren't you updating your site anymore ? How do you find out about these places ? Do you take special precautions ? Is it dangerous ? What was the most scary or dangerous place you visited ? Do you always explore on your own ? How different are night time explorations ? What stories do you make up when you get caught? Can I link to your site ? If this hasn't answered your question, you are more than welcome to send me a mail. You can order directly from this website. Send me an email stating your name and address and the message you would like me to write in it. I will sign your copy and send it insured with TNT in a protective envelope. Generally USA and worldwide customers will use the paypal system for payment, EU based customers wire transfer from bank account to bank account. Mail me for transfer details, or click the "buy now" button for paypal. I've published 4 books so far. (J. from Hungary) : It's amazing, like a caleidoscope, so different places in the world, so different kind of cultures, buildings... where most of us could never get to. So many abandoned places you've explored for us! You did a very good job again! I can't put it down. (J. from France) : ça faisait un moment que je surveillais la sortie du volume 3, voila c'est fait, j'espere que tu me le dédicacera comme les autres, c'est noel! In difficult light conditions, I measure light with a minolta spotmeter F, using (a part of) the principles of the zone system to decide how exactly to expose. I never use a flash, always available light and long exposure times. I've had some fun with a modified Holga ... and the superb XPAN. In the past I mainly used Kodak TriX for black and white for it's nice grain and high speed (400 asa). For maximum detail I changed to Kodak Tmax 100. I used to develop the negatives at home (black and white only) with Kodak X-tol (1:1 solution) which gives a nice full gradient of grays. After developing I scan the negatives with a Nikon super coolscan 5000 which is an excellent scanner providing sharp high resolution scans for large format printing. In 2006 I switched to digital reflex cameras and never looked back (although no camera is as beautiful as a Leica M). My first camera was a Canon EOS 5D ... in terms of dynamic range it didn't beat the Leica with film, but this type of camera really was more adapted for architectural photography. It served me very well. In 2009 I bought a Canon EOS 5D MarkII and in 2013 the Mark III. I've used a range of different lenses such as the Canon EF 14mm 2.8 L USM (Mark II), the EF17-40mm f/4L USM. Sinds a couple of years I'm only using tilt/shift lenses ranging from the 45mm, over the 24mm and the 17mm. These are extraordinary lenses in all regards, delivering stunningly sharp prints up to 1.2m x 1.8m for a single shot. Is Leica old fashioned, expensive and for snobs ? Yes and no : yes, it's old fashioned, but at the top when it comes to quality, sturdiness and size of equipment. It's a thing of beauty. It's expensive, way too expensive, but if you buy second hand you'll be able to resell at app the same price ... if you are on a tight budget don't even think about it : get some decent material and remember that it is YOU that make the photos. 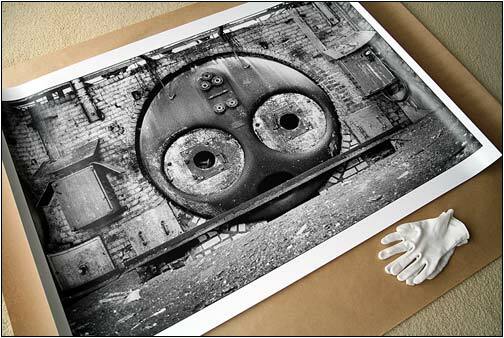 Prints are available for sale either directly through me or through a selection of art galleries. If you'd like to buy photographs please mail me the names of the photographs that you'd like : you can right-click on any photograph and find out the name by selecting properties. For overseas shipment I would have to get in touch with a professional printer in your area that would do the print for you. The alternative of having the photo sent over would probably be too expensive. If you wonder what size print you should chose follow this simple method : take a newspaper and cut it to the size of your choice. Simply hold or paste it to the wall you're intending to hang the photo. Take a couple steps back and judge how that size holds up in its context. Continue to experiment with different sizes until you're satisfied. Please specify the sizes, glossy or matte. Previous "customers" have all been very pleased with the result. If you're looking for high resolution scans for your design (CD-sleeve, web-design, ...) : contact me, prices usually range from 500 euro for the first photo (if you require exclusivity) or 250 euro if you don't. Subsequent photos will be discounted. In return you get a 300 dpi, high quality jpg, 13x18 cm (5x7") scan either via email (free) or on a CD. If possible at least the CD booklet should mention my name. Most of you are on a tight budget and I'm willing to do an effort, but I can't give away for free. I take risks and invest a lot of time and money in my projects so I expect people who want to use my art for their own purpose to contribute a bit in the costs. I must have done this all my life ... I remember vividly how my friend and I explored an abandoned villa in the dunes of Oostduinkerke ... we must have been 10. We all did these things when we were kids. Maybe I just didn't grow up and kept exploring. My first factory was Buda Marly in 1989. It was still operating then and I got caught almost straight away but that didn't stop me from exploring many other places. I can't go to any place in the world without looking for that open window, that hole in the fence or that unlocked door (I'm talking about abandoned buildings here). In the beginning the biggest thrill was to venture inside the building, always on my own explore and discover ... Later on I started taking photographs just to "prove" I had been up there. The last couple of years I started focussing more on the quality of my photographs and now the exploring pleasure is complete : the fun and excitement of the exploration, the pleasure of making the perfect shot, the satisfaction (or disappointment) when seeing the photos, the publishing on the web and the reactions of the visitors. With the increasing popularity of urban exploration it is important to build a tradition of respect, to apply an unwritten code of ethics of how we behave once we've crossed the border between the normal world and our secret world. The old Sierra Club 's motto "Take nothing but pictures, leave nothing but footprints" very much applies to the urban exploring community. Amongst urban exploreres vandalism, theft and troublemaking are considered poor ethics. We don't break anything for any reason, we don't tag our names to prove we've been here or there, we don't litter and we don't steal. The sites we visit are wonderful places we like to leave intact as we found them, just as we would preserve and protect a precious area of fragile nature. There is an interesting book written by ninjalicious called "access all areas" that can be bought online : it covers a lot of topics about urban exploration that can guide you through all sorts of questions (such as ethics). If you have nothing to say beyond a messy scribble of your name or your group's name, don't say anything at all. If you really can't suppress your instinct to mark your territory, please just wait until you get home and then urinate on your furniture until you get that weird evolutionary misfire out of your system. You don't need to take souvenirs to make both the experience and the site your own : you diminish your ownership of the place by defacing it or taking away a piece of it. Instead, adopt a zennish own-without-acquiring mindset (quote by Steven Wright) : "I have a large seashell collection wich I keep scattered all over the beaches of the world ... maybe you've seen it ?" However, there is a second website that focusses more on the photos and less on the stories, you may like it! These were the early days. Now there's the website and a growing group of "urban explorers". We keep in touch and share new discoveries. That's a lot of fun, but it does take away a bit of the mystery of discovering your own "forgotten civilisation". For people who want to find out if there are any such places in their own neighbourhood, I suggest to drive and look around : it's a good way to start. Asking the local people is tricky : they may help you really well but they may ignore the existence of huge places right next doors ... After I had unsuccessfully tried to locate a place in Liege I asked the police : he kindly explained the shortest route :) that was nice and convenient. Yes, I take precautions, and yes, it is potentially dangerous, very dangerous. Let me start by saying that exploring abandoned places is potentially dangerous, dirty and unhealthy. There are excellent web -sites on the subject and you don't have to go out and do it yourself ! First precaution is to let someone know where you are : I always take my mobile phone (with a loaded battery) and give my location when entering the premises. There is one disadvantage about mobile phones : they ring and it would be typically Murphy’s law that someone would call you when you are holding your breath because of a security guard around the corner (I know, you can turn the sound off and the vibrations on, but believe me you'll forget it until it's too late). Clothing is very important : use hiking or army boots with thick soils : there is broken glass and nails everywhere. They should also be waterproof : you don't want colourful chemicals inside your socks. I don't wear a helmet (but it could be advisable in some places), I don't wear breathing masks (although it stinks in some places), I don't wear gloves (don't pick your nose, you'll look ridiculous). Equipment is very limited but important : I use a flashlight that I fix on my head (hands free), always charge the batteries the day before. I also take a small spare flashlight and I can use the batteries of my photo-flash as a back up. A knife could be interesting although I've never had to use it. A leatherman is a good tool to have : versatile and handy. I used to carry a door handle that once "saved my life", but it's out again (until I lock myself up again somewhere). How dangerous is exploring ? I've been doing it for more than 15 years now and I've never been hurt once ... and I've never renounced to explore the most remote places. However there is a moment to say "stop, this is the limit", and you better say that once too often. Concrete structures are almost always very sure and solid. Steel and iron, if not corroded are very solid too. Wood is very treacherous : it can be dry and intact yet completely rotten inside : to be avoided at all cost. In general it's a good idea to walk on the beams. I'm always very careful with handrails : don't trust them, and certainly don't use them as your only grip. Apart from these "technical" aspects there is one BIG mistake that you should never make : don't walk around in abandoned places as you would in a cathedral : walking around and looking up, thinking "wow this is beautiful" : your next step will take you 3 floors down, forget about your mobile ! Sounds easy ? Even today I have to force myself to only look where I'm walking ! all the time ! I did lock myself in one day when a door slammed closed by a draft of wind. It was on the second floor of the Valdor hospital and none of the doors had handles. After trying all sorts of stuff a desperate kung fu manoeuvre opened the door. Dangerous buildings is a different story : you've got to understand the dangers and be very careful. Rather say "no" than take stupid risks. Scary can be fun, dangerous is to be avoided. I get the most satisfaction when being on my own, learning to know a new building. You need a special mental attitude when exploring an unknown place : it's dangerous yet intriguing, it's mysterious and you want to know more, you want to know what happened here, who worked here, who died here, who fell in love, ... you have to listen carefully to what the walls have to tell you, sit down, be quiet and let the ghosts tell you their story, let the place become your friend, earn its trust make it reveal its secrets, soak up the atmosphere like a sponge. Sounds loony ? of course ! but that's how I do it, and I can only do this on my own. This being said, I do from time to time go out with friends photographers and spend the day somewhere. But that's pure for the photographic fun, the ghosts stay in their corner those times. Also a (girl)friend of mine has been a model in several abandoned buildings ... she's somewhere on this site taking a shower !!! I never do night time explorations ! That would be like suicide : never explore an unknown place at night. I've been to several places at night though : but only places I knew well. I've done this on my own and I can assure you that it's scary like hell ! No more "sitting down quietly and enjoying the view" : only "what's that sound ? did I see something move there ? was that a flashlight ?". When I do this I always go there before sunset : to make sure the place is "mine". When the night falls there is this special atmosphere. And then, when it's been dark for a while, slowly your instinct starts telling you it's time to go. Of course some places are more scary at night than others : the Buda Marly factory is not scary, the Lemaire hospital simply is haunted !! None ! if you get caught don't try to be smart : it will only make it worse, these security guys aren't stupid. Simply say what you're doing, say that you understand that he's doing his job and that you're sorry causing him any trouble. Of course every situation is different : offering a cigarette and start a pleasant chat may be the solution, but it may as well get you a fine for a non-smoking violation.On the other hand, if you anticipate being caught : hide your exposed film rolls and put a new film in your camera : they might confiscate it. Of course you can, every other link promotes the site. However I insist that my work shouldn't be linked to political ideas. If you like you can use the banner below (just copy) and resize it if needed. Let me know when you're done ! I get too many requests from people who ask directions to a certain place without even knowing in what part of the world it is ! This is not a tourist office : you've got to do the basic research yourself (google the name of the place, use a route planner to find the exact location).